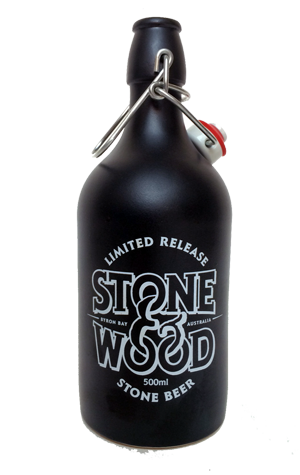 Stone & Wood's Stone Beer has become more than an annual release that pays homage to an old brewing style (while making use of head brewer Brad Roger's collection of volcanic stones). These days, the brewery uses it as an excuse to bring friends from the beer world to its Byron Bay home for a day long celebration of what they do as a fire is built, rocks heated and then added to the beer in the kettle. One imagines there's plenty of celebration going on around the brewery now too, following their triumph in the 2016 Australian International Beer Awards, one that the owners dedicated to their increasingly large team. And it was members of that team that took the reins for the latest Stone Beer, with Brad relinquishing control and letting some of the younger pups come up with the recipe. They came up with one that features no less than seven malts, which in combination deliver a beer as black as the reusable black, swingtop bottles that a limited amount of the beer has been released in. It's a full bodied, smooth affair in which cocoa and dark chocolate dominate, with a touch of caramel sweetness and earthy dryness closing things out. Look out for a launch party near you too, starting from late May – details here.